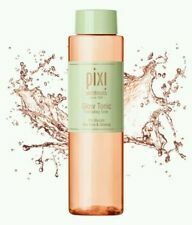 The Pixi Glow Tonic™ is highly concentrated, invigorating facial toner that deeply cleans pores by sweeping away excess oil and impurities. Brand new unused Grab a bargain! Product Details • Exfoliates and purifies the skin with Glycolic Acid • Ginseng improves circulation and energizes • Aloe vera soothes and hydrates • Refines the appearance of pores • Gently accelerates cell renewal to reveal a brighter, glowing complexion • Balances, heals and soothes for radiant, healthier looking skin • Alcohol free • Suitable for all skin types • Not tested on animals • Volume: 250ml No returns! Exfoliating facial Glow Tonic™. It removes dead skin cells for healthier looking skin. For all skin types. Alcohol free. PIXI Glow Tonic - 100ml. Ginseng improves circulation and energizes. Aloe vera soothes and hydrates. Active ingredients: Glycolic Acid-5%, partially neutralized by Ammonium Hydroxide. > Alcohol free formula with low tingle neutralised glycolic acid effectively removes dead skin cells resulting in a smoother, clearer more radiant complexion. Exfoliating facial Glow Tonic™. It removes dead skin cells for healthier looking skin. For all skin types. Alcohol free. Ginseng improves circulation and energizes. Aloe vera soothes and hydrates. PIXI Rose Tonic Rose & Elderflower Nourishing Toner 100ml Brand New . Condition is New. Dispatched with Royal Mail 2nd Class. New Pixi Skintreats Retinol & Jasmine Flower Tonic Toner 100ml. Condition is New but unsealed as it came in a gift set. Dispatched with Royal Mail 2nd Class signed for. Please note that refunds will only be given for cosmetics and toiletries if item is faulty. This is for hygiene reasons. Thank you. Pixi Glow Tonic 250ml *Brand New And Sealed*. Condition is New. Dispatched with Royal Mail 2nd Class. Skin is left feeling fresh and revitalised. Free from parabens. Not tested on animals. Aloe Vera, ginseng and botanical extracts work together to soothe and treat skin while 5% glycolic acid accelerates cell renewal. Alcohol-free and gentle on all skin types. Glow tonic with ginseng and fructose. Exfoliating facial Glow Tonic™. It removes dead skin cells for healthier looking skin. For all skin types. Alcohol free. Gently accelerates cell renewal to reveal a brighter, glowing complexion. Aloe vera soothes and hydrates. 5% Glycolic Acid Exfoliating Toner. 250ml - Full Size. • Exfoliates and purifies the skin with Glycolic Acid. GLOW TONIC. From PIXI. • Gently accelerates cell renewal to reveal a brighter, glowing complexion. Rehydrates, replenishes and refreshes. Suitable for even the most sensitive skin types. Alcohol free. Orders paid for by cheque will be dispatched once the cheque clears in my bank. I will always help where I can. Two new and sealed 100ml bottles of Rose & Elderflower nourishing toner. RRP for 100mls £10. Rehydrates, replenishes and refreshes. Rose Hydrosol based toner that hydrates and neutralizes skin. Use: Either in the AM and PM or when needed. Powerful antioxidants and botanicals replenish the skin for a smoother, softer appearance while soothing sensitive skin. Jasmine Flower heals & balances. 15ml / 0.5 fl. Formulated with 5% glycolic acid, it exfoliates, brightens and smooths skin. Aloe Vera, ginseng, and botanical extracts work together to nourish and treat, revealing an improved complexion. Glow Tonic 40ml. An exfoliating face toner that exfoliates and purifies to promote smoother-looking, radiant and clarified skin. Rose Flash Balm 15ml. Peel & Polish 15ml. A 3-in-1 radiance-enhancing balm that energises the appearance of lack-lustre skin. 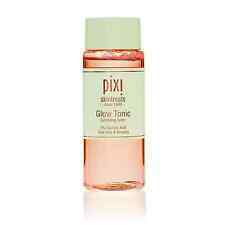 Pixi Skintreats Rose Tonic nourishing toner travel size 40ml . Condition is New. Dispatched with Royal Mail 2nd Class (2 to 3 working days). Calming, redness - reducing tonic with aloe and chamomile refreshes and replenishes skin. Pixi Skintreats – Glow Tonic 100ml x2 [200ml]. Aloe vera for hydration and glycolic acid to gently exfoliate and purify. New – sealed. Pixi Vitamin Wake Up Mist. 80ml. New And Sealed. Bought and just found out that I am intolerant to lavender and there is lavender oil in this. I’ve bought this many times before my intolerance and it really brightens the skin and makes it look less lined. It’s a vitamin shot for the skin. Sealed new. Happy bidding. Condition is New. • Exfoliates and purifies the skin with Glycolic Acid. • Gently accelerates cell renewal to reveal a brighter, glowing complexion. How To Apply • Aloe vera soothes and hydrates. • Not tested on animals. 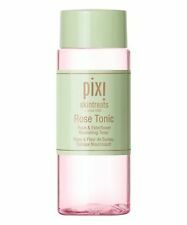 This PIXI Skintreats Rose Tonic Rose & Elderflower Nourishing Toner 100ml is new and sealed. (I know it is sad but there's nothing I can do.). 2 x 40ml each - TRAVEL SIZE. PIXI BY PETRA Rose Tonic Nourishing Toner. NEW: PIXI SKIN TREATS ROSE & ELDERFLOWER TONIC NOURISHING TONER. balance pH, minimise redness and calm skin. Rehydrates, replenishes and. Suitable for even the most sensitive skin types. Size 3.4 fl.oz /100 ml. New listingPixi Rose Tonic Rose & Elderflower Nourishing Toner 100ml. New & Sealed. PIXI ROSE TONIC ROSE & ELDERFLOWER NOURISING TONER - SIZE 100 ML. USE MORNING AND EVENING. Pixi Glow Tonic With Aloe Vera & Ginseng 100ml by Skintre ats. Calming and Redness reducing tonic with aloe and chamomile. Rose & Elderflower Nourishing Toner. Pixi Skintreats – Rose Tonic 100ml x2 [200ml]. New – sealed. A soothing toner, great for sensitive skin 🙂. Both are in pristine condition and unopened with a cellophane seal. Pixi Beauty, Skintreats, Glow Tonic, Exfoliating Toner, For All Skin Types, 3.4 fl oz (100 ml). The brightening tonic removes dead skin cells, leaving skin healthy and radiant-looking. Formulated with 5% Glycolic Acid, it hydrates the skin whilst Aloe Vera and Ginseng help to nourish during and treat. PIXI Rose Tonic Rose & Elderflower Nourishing Toner 100ml Brand New . Condition is New. Dispatched with Royal Mail 2nd Class. Any questions please ask. 2 x Pixi Glow Tonic SEALED Exfoliating Toner With Aloe Vera & Ginseng. Exfoliating facial Glow Tonic™. It removes dead skin cells for healthier looking skin. For all skin types. Alcohol free. Ginseng improves circulation and energizes. 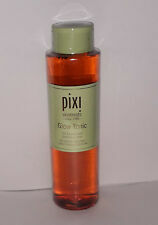 Pixi Skintreats - Rose Tonic, Nourishing Toner. Sample, Travel, Trial Sizes - 40ml X 3 (120ml). Pixi Rose Tonic Rose & Elderflower Nourishing Toner 100ml. New & Sealed.